Earlier this week my blog buddies Ashley in Mississippi and Ruth-This GRITS Tale (also in Mississippi) shared their fall goals. I loved reading theirs, I thought this would be a good time to share mine as well. The leaves are starting to turn and the air is crisp today, so I'm officially in the mood for Fall! View from our back porch this morning. Some of my goals I've already accomplished! 1. Get a new fall Candle. 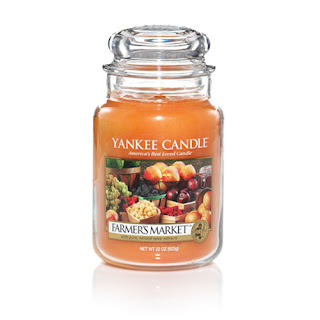 This I can already checked off my list, for the past few weeks I've been burning Yankee Candles Farmer's Market- I LOVE IT! I even went all candle burning fancy and bought a wick trimmer. 3. Go on a hike to see all the fall leaves. 4. Head down to Jacksonville for FL GA, gotta cheer on the Gators at least one more time this year. And according to my husband FL GA kicks off the Holiday Season (and the best tailgating takes place on Wednesday and Thursday) which means we'll be in the RV Lot by Wednesday night-ha! 5. Stay toasty around a bonfire or fire pit. 6. Go on our babymoon. Our last get away, to enjoy each others company and be a carry-on only family. If only I could keep my husband in the country long enough to actually go somewhere with me-ha! 7. Hosting a fantastic Thanksgiving dinner for friends and family. Ohh the menu, shopping and tablescaping. I can't wait! 8. Speaking of decor, take pictures of my super cute fall decor and share on this blog of mine. I decorated in time to share with all the fall home tours that started back in September, but somehow never got my camera out to capture my mantle, the wreath I made, our pretty table, and other goodies around here. 9. Speaking of sharing, I have a life changer to share with y'all. Are you ready?? Pumpkin Spice Marshmallows. That's right people! 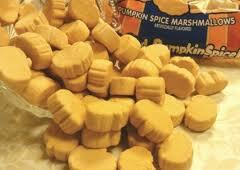 My grocery store didn't have any canned pumpkin, bu they did have these and they are the perfect fall treat. You just need 2-3 for the perfect taste of fall. 10. Plant my pansy's. The ones I planted last year made it through the fall, winter, spring and into summer. I can wait to have them bursting through snow again this winter. 11. Black Friday Shopping, I gee I love the deals! 12. Sit on my backporch and enjoy the leaves, crisp air, my pansy's and a hot cup of tea. Great list! I love the fall and I'm always trying to pack in as many activities as possible. And pumpkin spice marshmallows...yum! I can't wait to see your fall decor and I hope you get to do everything on your list. P.S. 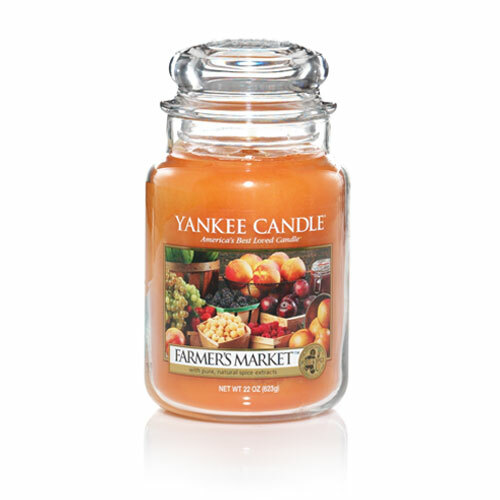 Farmer's Market is one of my favorite fall scents from Yankee! I love your list! And have an awesome time cheering on our boys in Jacksonville (my hometown!)! Go Gators!! I'm so jealous of that foliage! I wish Mississippi got more vibrant colors like that! Post that decor I want to see it! i love your list. I saw some mint chocolate marshmallows and have been meaning to go back for some to put in my hot chocolate. I love the leaves changing outside your doctor's office. The leaves are beginning to change here but they are not as colorful.